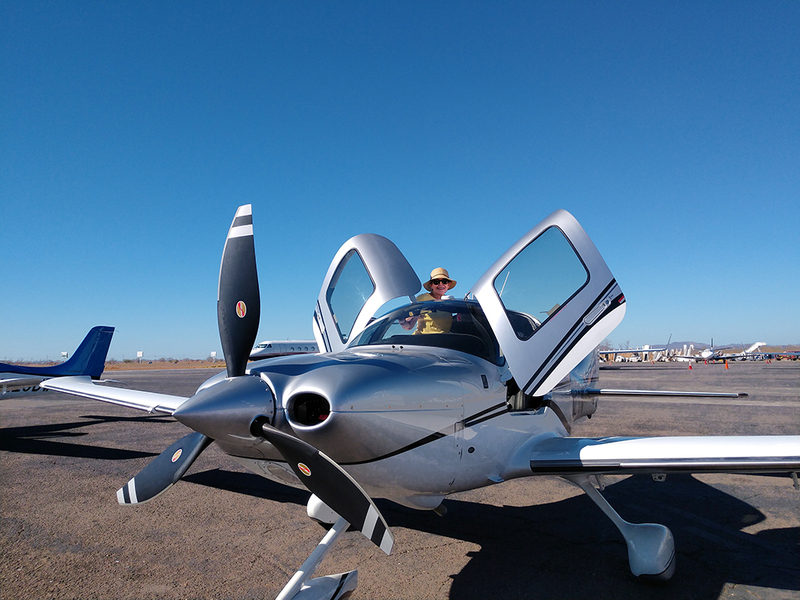 This trip actually started on our first Cirrus Owners and Pilots Association (COPA) trip to Central America, several years before. 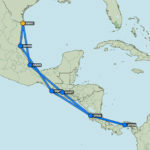 We were very close to Panama, but the logistics, schedule and cost prevented us from even doing a flight from Costa Rica over the Canal. Caribbean Sky Tours (CST) had organized the first unaccompanied trip, which was great. When I heard they did a Panama trip in 2017 I contacted them and then met with the principles at Air Venture in Oshkosh in the summer of that year. We organized the trip, using what we learned from the first trip and added representatives (the principles) accompanying us. 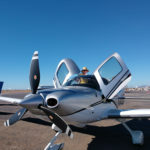 About CST, they are a 15 year old company managed by Rick and Pia Gardner, founders, who specialize in organizing and managing flights to the Caribbean, Bahamas, Central and South America. Their primary business is planning, organizing and supporting corporate flights in this region, but they also do trips for groups. They are the premier quality supplier, who have the infrastructure to plan and support flights in this difficult part of the world. Such things as over flight permits, customs and immigration requirements, local aviation regulations, facilities, routes and on and on, are what they know. CST collected a huge amount of data and documents from us to make sure that we were good for any foreign aviation or immigration requirement. They have a network of agents and an in house computer supported group of flight coördinators who not only plan, but also track every flight. As an example when our 12 planes where coming back to the U.S., CST was also managing 18 other flights in the region. The local knowledge CST has, plus the organizations infrastructure makes under taking a trip like ours not only possible but by Latin American standards hassle free. So with CST’s help we announced our Adventure on the COPA web site and it sold out in less than 15 minuets, with a long wait list. COPA doesn’t like to disappoint members, so we asked CST, could you do a second trip, they came back and said yes, so again we sold the second trip out in 15 minuets. So we had two trips, at maximum capacity, which is governed by how many planes we can get though customs, refueled and achieve out destination in a flying day, which turns out to be 12 with a reasonable margin of safety. 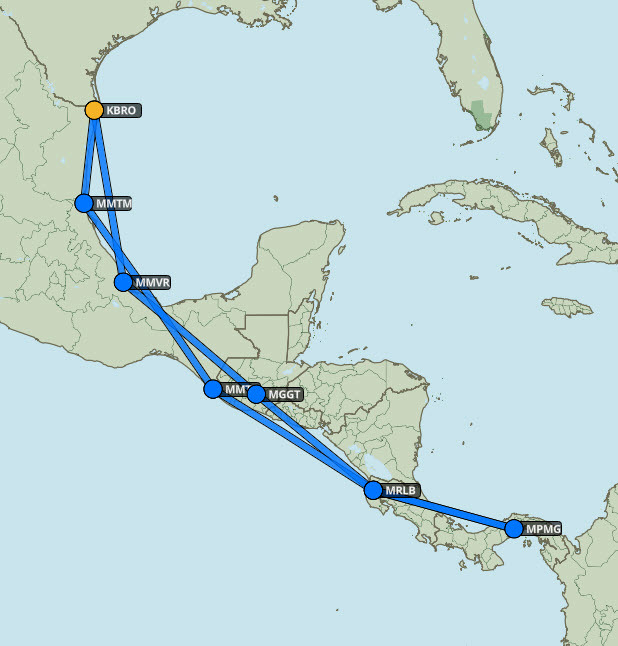 In the months leading up to the trip the participants received a number of emails with planning information. Several months before the trip the flight plans and routing were sent and a month before the trip we had a teleconference call to go over the material and answer questions, so if you read the material and did normal conscientious trip planning there would be no need for changes after the trip began. We were in good hands and should be prepared. So now with all of this, planning and preparation now its time to fly to our U.S. jumping off airport, in our case Brownsville, Texas. A look at the forecast and on the day of our planned departure, morning fog forecast at Hilton Head, and also the day before. The decision fly Monday the 20th of February a day early. At least we could get half way if we left late, which is what happened, so we spend the night in Hammond, LA, just north of New Orleans. This is an adventure trip so we start with an adventure. As usual Hammond, turns out to be an interesting place and we have a fun evening made possible by a great FBO, Pierce Aviation. Next morning we fly on for the second four hour plus flying day to Brownsville TX. Head winds the whole way west and 30 knot gusts upon doing the instrument approach into our destination airport. Yes, it is going to be an adventure trip. That evening we meet Rick Gardner of CST and organize our first meeting at the hotel. We have our first briefing of the group and then go to local restaurants for dinner. The inevitable bounding of fellow pilots and adventurers starts. Tomorrow we are off on our adventure.